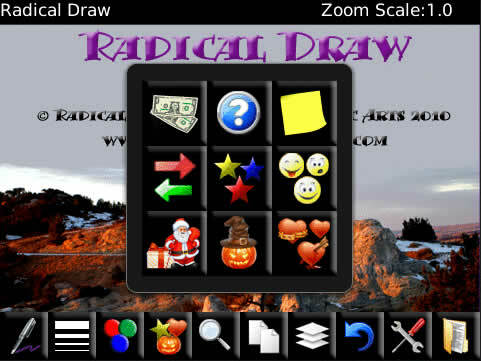 Radical Draw is design specifically for the Blackberry Storm and makes full use of the touch screen with stunning custom graphics and custom buttons. A fusion of art and function. Radical Draw is a powerful drawing application that can be used to draw on photographs or to create your own pictures. Even if you have no artistic abilities, you can still look like a professional by using Radical Draws clip art, or our text tool to add titles to your photographs. An excellent tool for personal use or for professionals like architects, insurance companies, or emergency personnel. PLEASE NOTE THAT Radical Draw REQUIRES OS v5.0.0.320 MINIMUM. Includes clip art to help those without artistic abilities create professional looking pictures.